The summer of 2000 has proved to be a long, arduous fire season throughout the country. Severe drought throughout much of the west, above normal temperatures and below normal precipitation, coupled with a 4-6 week delay in the southwest monsoon season has resulted in many fires burning at one time with rapid rates of spread and extreme fire behavior. On August 11, 2000, in excess of 60 large fires were burning, with fires in nearly every geographic area. Resources were stretched thin and fire personnel were beginning to show the strain of a long, hard season. On August 5, 2000, two fires were ignited on the Wind River Indian Reservation in Wyoming. The fires were reported to the agency at approximately 1400 hours on August 7th, 2000. Initial attack action was taken immediately. With the scarcity of resources geographic area-wide and nation-wide, the agency was having difficulty getting the resources it was requesting through the Rocky Mountain Coordination Center. The two fires escaped initial attack and went into extended attack under a small Type 4 organization. 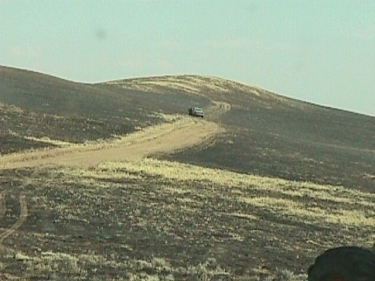 On July 30, 2000, a strike team of type 6 engines had been ordered for the Middle Enos fire out of Worland BLM. The strike team consisted of three (3) Oklahoma State Forestry engines and one Chickasaw Nation engine, each with a 2 man crew. The strike team reported for duty on the Middle Enos on August 4th. On August 10th, the three Oklahoma State Forestry engines (#2, #4, and #10) were released from the Middle Enos Fire and reported to Worland BLM on severity. The fourth engine, Chickasaw Nation #2, reported directly for assignment to the Kates Basin Complex. The afternoon of August 10th, Oklahoma #2 and #10 were dispatched to the Kates Basin Fire. Engine #2 and #10 worked on the Kates Basin fire until approximately 2230 hours on August 10th, then bedded down next to the engines. The August 11th shift started at approximately 0500 hours with a briefing at 0830 hours from ICT4 Mike Brown. The engines were assigned suppression activities throughout the morning. At approximately 1230 hours Oklahoma Engines #2 and #10 were directed to the Mexican Pass area to assist with holding a dozer line. Oklahoma Engine #2 arrived first and discussed a plan of action with a Hot Springs County engine crew. Oklahoma Engine #2 would continue east on the two-track, turn around at the dozer line, and hold and protect the corner. When Engine #2 was turning around, at approximately 1430 hours, the corner had ignited, forcing the unit to back eastward on the two track, about 60 feet. Foreman Burnett started the pump but didn’t have time to begin any engine protection. A flaming front forced him to retreat eastward, approximately 900 feet on the two-track, then he left the two-track, heading in a southerly direction, approximately 250 feet, when he was overtaken by the fire. Burnett was found shortly after with a partially deployed fire shelter and holding a portable hand held radio. The Hot Springs County Coroner later removed Burnett’s body from the mountain. Crewman Presley Byington was unable to leave the engine and deployed his shelter in the cab of the engine. He received minor burns and smoke inhalation. He was transported to the hospital by helicopter and released on August 12, 2000, at approximately 1300 hours. He returned home on August 13th, 2000. On August 11, 2000, at approximately 1450 hours, FMO Bob Jacob and Perry Baker, Agency Superintendent were notified of the entrapment and fatality. The Agency’s serious accident notification procedures began. The Serious Accident Investigation Team (SAIT) was in-briefed at 1400 hours on August 12, 2000, at the Kates Basin Incident Command Post (ICP), located at Riverton Fire Academy. The SAIT has conducted the investigation as outlined in the DOI 485 DM Chapter 7. Presley Byington and the crew members of Engines #4 and #10 returned to their home unit on August 13, 2000 on a chartered aircraft. Engine #2 at intersection of dozer line and two-track.